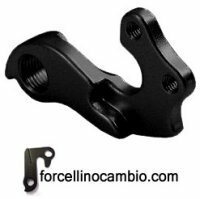 Derailleur hanger for Bottecchia 350 man 2014, aluminum 5086 CNC machined Made in Italy. Bulls Copperhead 29er 2013 - 2015 derailleur hanger, aluminum 5086 CNC machined Made in Italy. Derailleur hanger for Carraro 149 Setteguadi anno 2014, aluminum 5086 CNC machined Made in Italy. Colnago AC 2014 derailleur hanger, aluminum 5086 CNC machined Made in Italy. Colnago Ace 2011 derailleur hanger, aluminum 5086 CNC machined Made in Italy. Colnago Arte 2.0 2011 derailleur hanger, aluminum 5086 CNC machined Made in Italy. Colnago Arte 2008 e 2011 derailleur hanger, aluminum 5086 CNC machined Made in Italy. Colnago CF7 2010 derailleur hanger, aluminum 5086 CNC machined Made in Italy. Colnago CLD 2014 derailleur hanger, aluminum 5086 CNC machined Made in Italy.